Fall is Here & that means Beer! Old Town Oktoberfest celebrates all things German - but the Beer is the star of the show. Everybody is sad to see summer go until they remember the "awesomeness" of fall. Fall in Michigan brings with it football, tail-gaiting, apples, pumpkins, gorgeous fall colors and of course - beer. Beer and fall go together like peanut butter and jelly, ask anyone who is a beer lover and they&apos;ll agree. Truthfully, if you ask a real beer-lover, they&apos;ll tell you beer goes great with cupcakes too... Just take this bloggers word for it - a earthy drink that warms you up inside is perfect for fall. Well, while Spartan football in East Lansing is rolling along, holding up its end of the bargain for a great fall, there is some fun in Old Town Lansing next weekend that you simply must check out. Join Greater Lansing and beer-lovers from all over as we celebrate the 9th annual Old Town Oktoberfest (Friday/Saturday, October 10th 6-11pm and October 11th 2-11pm), Mid-Michigan&apos;s only German Oktoberfest event. 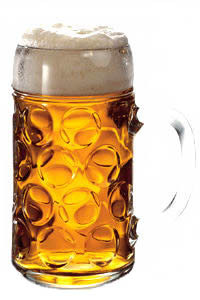 Old Town Oktoberfest features German food, live music, dancing, and 12oz souvenir mugs filled with German-style beer. In addition to beer, there will be hard cider, non-alcoholic beverages and water. Inspired by the festival, local food vendors will put a delicious German twist on their usual menus to pair perfectly with the German beer. Speaking of German Beer - fan of that, by chance? You&apos;re in luck. Take a peek at this list of on-tap brew&apos;s simply waiting to entertain your senses with delight. Now before you read this list, if you&apos;re not a fancy, worldly beer aficionado, don&apos;t panic. You don&apos;t have to necessarily be able to PRONOUNCE it to ENJOY it. Trust me though - this is the good stuff baby! Tickets are just $20 at the door or only $15 if purchased in advance before Thursday, October 9 at midnight (online or at OTCA).This two-day event attracts visitors from all over the Midwest (sorry kiddos, strictly 21 and over both days of the event.). After all, how can one resist two days of musik, essen, and bier? Come either Friday or Saturday, October 10 and 11, or both days for the price of one! Summer is gone, yes, but fall is here and that means Beer! Come celebrate fall and the age-old German craft of top-notch brew with your favorite crew!